Tony approached me to work on redesigning his site after he saw what I did for his partner, Robert Maggio. I enjoy working with other artists and creatives; they understand the value of good design and they like to be a part of the creative process. As you can see from the before and after screenshots, the end result is stunning, because we are showcasing his work. The site interface is in the background, making each of his colorful paintings stand out as a group, and on their own. I’m quite proud of my team for making the site perform well on desktops and on mobile devices. We coded the site as “responsive” to ensure the longevity and value of his investment. The homepage has a slightly different feel on my mobile as it does on my desktop. 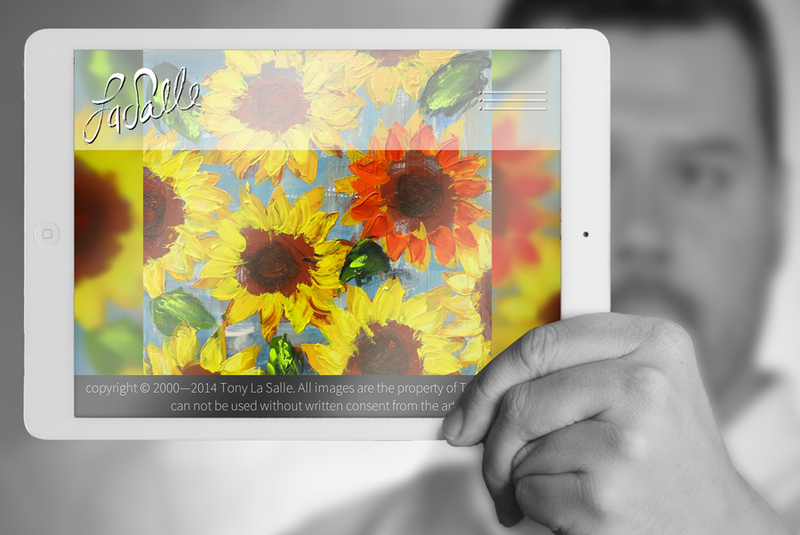 With larger images, copyright protection statement, and the ability to edit and manage his site, Tony’s site is as beautiful as his work. Employing a tried-and-true workflow of Discuss, Discover, Design, Develop, and Delivery, Tony and I were able to accomplish a lot at the beginning of the project. Our decisions were carried through all the way to the delivery (site launch). We discussed his desire to make his paintings the focal point of the site. I showed him other artist sites, some “full-screen” sites, and some photography sites. My suggestion was to make the site minimalistic so that his art would play the hero and the site would play the side-kick. The site is an understated yet essential frame to hold his artwork. The site is more of a frame for his content, than it is about its interface or graphics. It’s purely about the content. 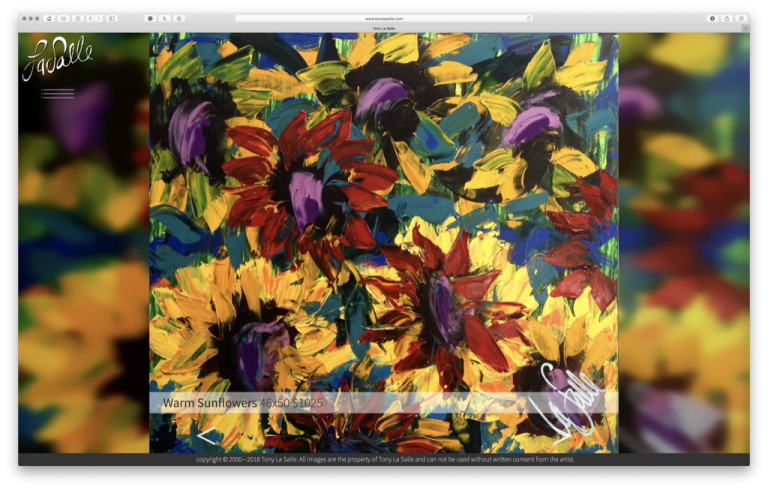 The previous site was more about the colorful background than it was about his artwork. Now, his artwork is the focus, as it should be. Not everyone needs a billboard on their homepage. Tony did. 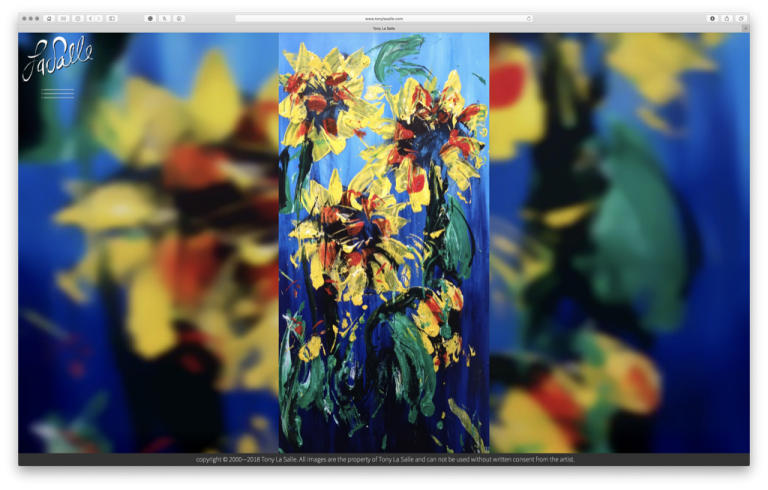 We built a unique homepage slideshow to accommodate paintings of any proportion, be they wide or tall. Now, what to do with the background? 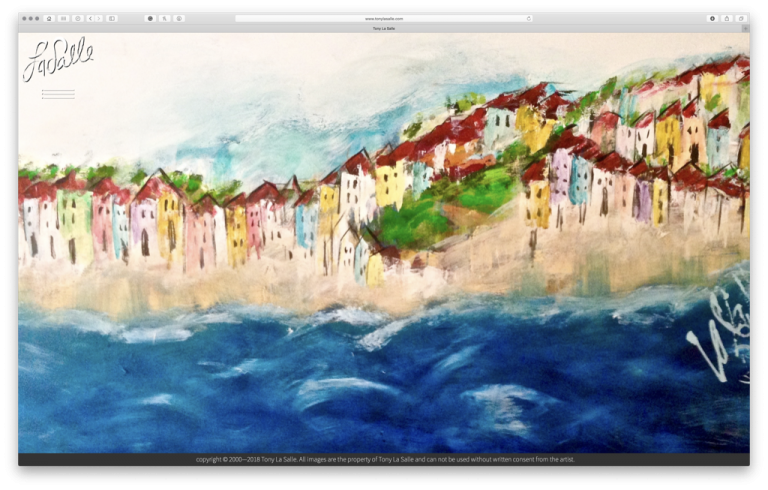 Instead of a white, black, or neutral background, we duplicated the foreground image, added a dynamic blur, and darkened it. This gave a very moody effect which enhances the impact of Tony’s paintings’ brilliant colors. Check out the homepage so you can see how awesome this looks! Tony’s location on the corner of Bridge and Union in Lambertville, NJ, is a prime hub of traffic for commuters to and from work to Princeton, Trenton, and New York; Tony’s ideal demographic. 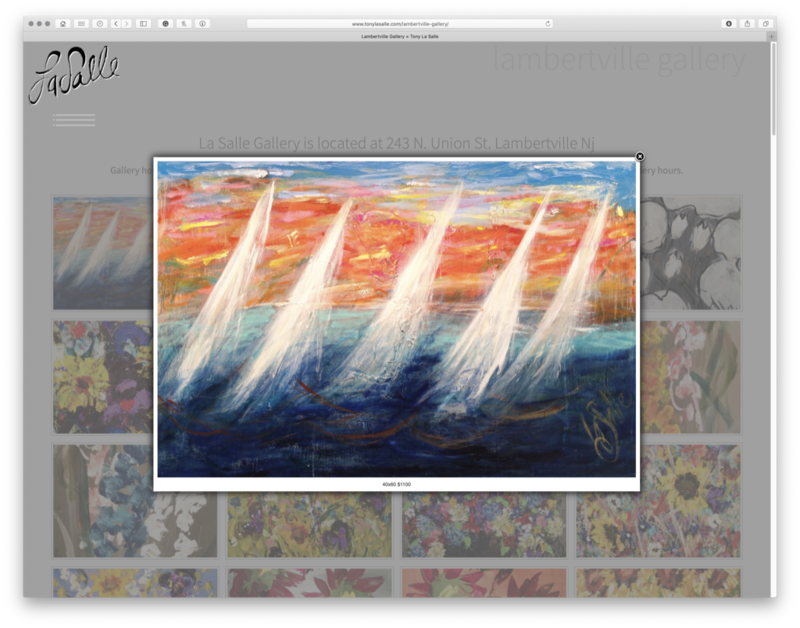 So, when using their mobile phones and making a hands-free search for “Tony La Salle Gallery“, I needed to make sure that the site looked beautiful and large on a handheld device. We succeeded. The previous site did not show large images of his paintings. This may have been because of smaller screens and lower bandwidth limitations at the time it was developed. Today, we have retina displays and hi-speed bandwidth and LTE (4G for mobile). So, as technology improves and consumers adapt, so does marketing. 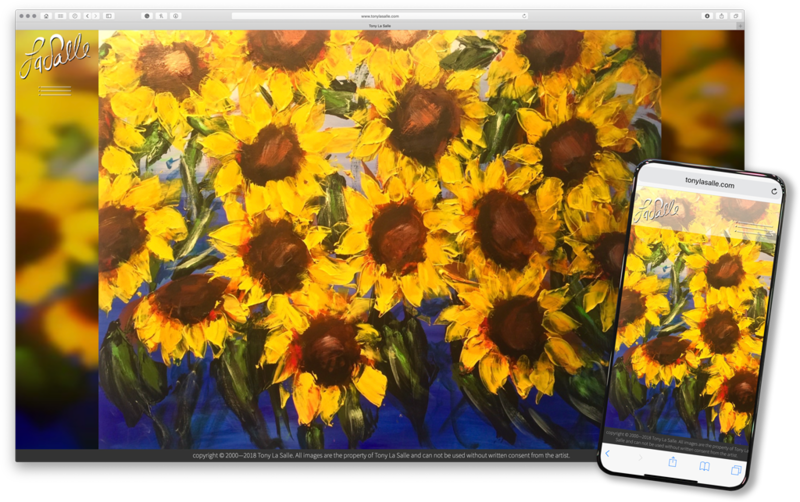 Each cropped thumbnail shows the full-screen large image of a full painting. This really improves the possibility of a purchasing decision when viewing a large image. To protect these, we made it impossible to right-click to save the image to a computer, and added a needed copyright note on the bottom of the browser window on every single page. Take that you thieves! I mean, don’t take it, its the law! WordPress offers the easiest to use framework for most of the sites I provide. Now Tony and his staff can manage, edit, and enjoy updating his site. He no longer needs to pay maintenance fees to update the site’s contents, or have to wait to post his latest masterpiece to share with the world. His site works for him, rather than the other way around.